This illustration was created by Jean-Pierre Luminet in 1979. 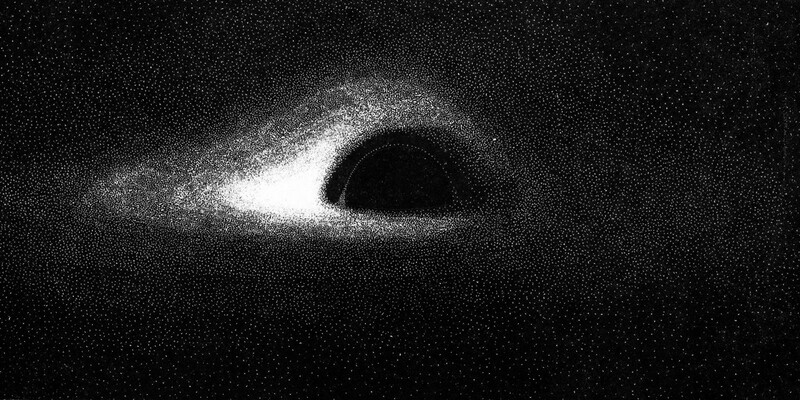 It was made using ink and a computer program and was the first attempt at visualizing black holes. The left side of the black hole is much brighter because it was spinning counter-clockwise, approaching the viewer on the left. Every picture anyone has ever seen of a black hole has been a depiction, an artist rendering of what we think these giants will look like. Until now, the closest we’ve come to directly sighting a black hole is by observing the effects they have on objects around them — causing stars to orbit at the center of our galaxy, spewing out powerful jets, and devouring interstellar matter during accretion. Material crossing the infamous event horizon leaves a certain glow. We can’t see this with our eyes alone but the friction causes the material to heat up by millions of degrees, making it possible to detect through x-rays and leaving a cloud of particles bigger than entire galaxies. Black holes also have a foundation in physics where they’re predicted to exist by Einstein’s theory of general relativity. However, Einstein himself doubted whether or not they could be real. The black hole at the center of our Milky Way isn’t nearly so active. But while it might be quiet, it’s also huge, boasting a mass 4 million times greater than our sun and a diameter 17 times larger from where it sits 27,000 light years away. It’s classified as a supermassive black hole, the largest of the three types. How these black holes form is still debated but suggestions include thousands of smaller black holes merging together or a cluster of stars all collapsing at the same time. These giants are responsible for phenomena like quasars — some of the most powerful and brightest events in the universe. Most black holes are significantly smaller and further away, adding to our difficulty in observing them. Even photographing the black hole at the center of our galaxy — Sagittarius A* — is the equivalent of photographing a small ball on the moon from where you stand here on Earth. Attempting to do it using the Hubble Space Telescope, for instance, would require a resolution 1,000 times better than what it currently has. 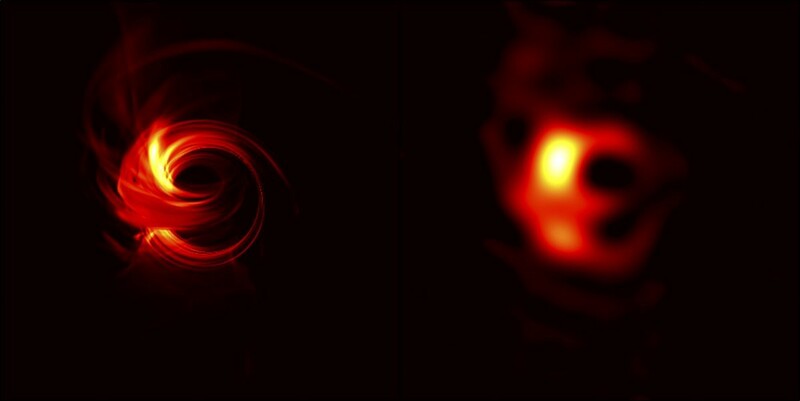 This image from Interstellar shows the accretion disk in motion around the black hole. Instead, the solution was to increase the width of observable space by forming the Event Horizon Telescope — a collaboration between different radio telescopes and facilities from around the world to create a virtual telescope nearly as big as the Earth itself (6,200 miles in diameter compared to Earth’s 7,917 miles). A telescope this size is capable of ultra-high magnification and of seeing past the shrouds of gas in the Milky Way and around the black hole. The telescopes were then coordinated to focus on Sagittarius A* for 5 days in April of last year, recording radio waves and saving these onto hard disks. The information had to be saved onto hard disks because it was far too large — we’re talking millions of gigabytes — to be sent through the internet. They were flown in and collected via planes, the last flight of data coming from Antartica where there’s very sparse transportation. Researchers are predicted to finish analyzing the data and compiling it into an image this year, giving us our first ever look at a black hole. What will that look like? Well, the picture is intended to reveal the contours of the black hole, showing its silhouette against the background of radiation and the bright matter swept into the hole’s event horizon. However, this isn’t just something that’s visually magnificent; it will also be a test of general relativity, either further proving or conflicting with what’s been a very successful theory up until now. If Einstein was right, Sagittarius A* will be circular, emit radio emissions up to a certain point, and be just a certain size. Any deviations from these predictions could bring into question what we know about general relativity. A simulated image of what we expect to see. From the National Radio Astronomy Observatory. The Event Horizon Telescope also focused on a second black hole, though this one is much bigger and resides in a different galaxy. It’s the black hole of the M87 galaxy — containing a mass of 6 billion suns and sitting 60 million light years away. It’s powerful enough to devour our solar system. The M87 galaxy is the largest in the Virgo Cluster, another line in our cosmic address. Unlike Sagittarius A*, the black hole at the center of this galaxy is very active and is powering a jet of particles blasting out at around 98% the speed of light. This year was also the first time we’ve witnessed a black hole ripping apart a star two times the size of our own sun, resulting in a blast captured by telescopes watching Arp 299 — two colliding galaxies. When materials are swept into a black hole from a star, they create an accretion disk. The disk forms at the hole’s equator but light bent upward through gravity causes there to appear to be two bright, raging disks, as seen in the depiction of Gargantua from Interstellar. When the image is released later this year, it will be an important moment in the history of mankind. Not only as space explorers, but as a species capable of innovation and foresight, having predicted these interstellar giants over a century before we can finally see them ourselves for the very first time.